As soon as I graduated from high school, I went to The Golf Academy of America in Florida to pursue a career in golf. I received a degree in Golf Complex Operations and Management, club fitting certificate, and certification of PGA Instruction. During my seven years in the business, I gradually found out how seasonal the industry was. In addition, I was not making as much money as hoped. I worked under a PGA professional and managed the pro shop where I sold more merchandise than he could order. He (the PGA Pro) had mentioned to me that I should pursue a career in sales as he felt (and witnessed!) I would be very good at it. 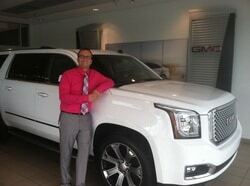 I decided to try the car industry and hired in at Randy Wise Automotive group – Buick GMC in Fenton, MI. I absolutely love this industry as I am dealing with an array of different people daily. I have no idea what will happen tomorrow and that excites me! This is a decision I should’ve made years ago!!! I have learned so much about the car business and sales during this one short year I’ve enjoyed the industry. Through trials, I have found that customer service and making sure the customer is 100% completely satisfied is the most important factor in a transaction. I have proudly maintained my own CSI score of 3.94 out of 4. The owners and management voted for Theron Wilson as, “Employee of the Month” for the month of May 2014. Randy Wise employs over 800 stellar individuals, so it was quite the achievement. When the CEO of Car Pal, LLC, Lindsay Graham asked for a sales manager to work with her on a Yukon Denali purchase for her client in Idaho the manager entrusted me with the work which I was told would lead to many future sales with Car Pal car buying service. Lindsay, I, and our shared client worked together (straddling three different time zones) and managed to complete the transaction (all except for the final shipping, as the vehicle was picked up today!) within a matter of 72 hours. If I get the opportunity to work on behalf of Car Pal again, I will not hesitate for a second as Lindsay is not only efficient, but manages to make a car deal fun, exciting and easy, regardless of how many miles apart!! !